Thanks for registering on Score It Beta. It will soon become your favorite tool! 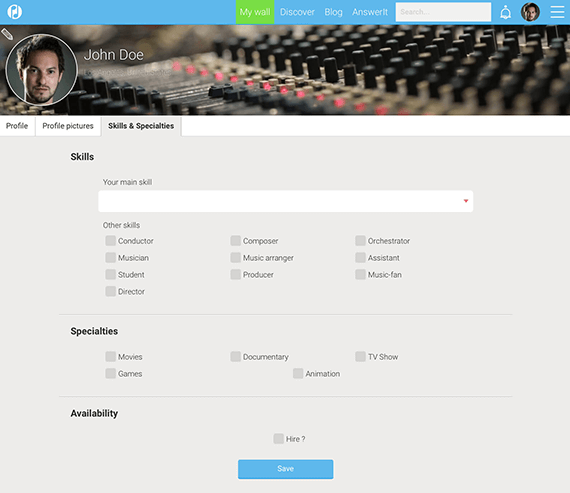 Score It is a brand new professional network for screen music makers of all kinds. Professionals and beginners, everyone is welcome! 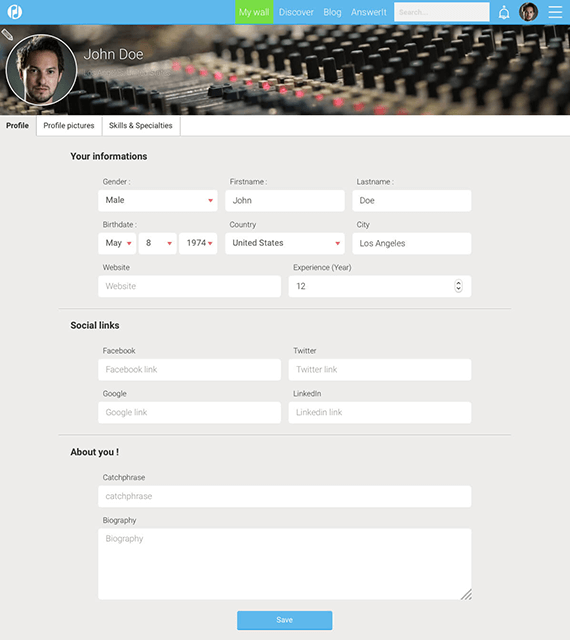 Not only will Score It help you get easily in touch with fellow composers, it will enable you to showcase your work in a clear and simple way and to link posts from other social network accounts (SoundCloud, Facebook, Twitter, YouTube, etc.) or your website. Thanks to SEO, producers, directors, broadcasters and agencies from all over the world will also use it to discover your work and contact you. Score It will soon offer a job database and provide a great opportunity to create a professional network, to share contents with other users through private messages and to exchange ideas or discuss issues on the forum. With all your personal informations and social networks / website links. Once it’s done, don’t forget to “Save” and then you can start filling your profile page with all your contents, by clicking on your profile picture. On the top content box, you can copy/paste some links from Soundcloud, Youtube, Vimeo, etc…, add some texts, upload some pictures from your desktop. If this is your work, you can tick the “My Work” box, then when you publish your post, it will automatically be placed on top of your profile page. Be creative and choose some nice visuals that reflect your personality and work ! You can follow other fellow users by clicking the “Follow” button on the homepage or on the “Discover” tab. Their profile will then appear on your “My contacts” page, and their contents will appear on your “My Wall” page. You can also quote the users you follow, just add @nameoftheuser and it will suggest you some users. Once it’s published, the user you quoted will receive a notification in his “My notifications” tab. You can comment the posts of the users you follow, and quote people in the comments too. 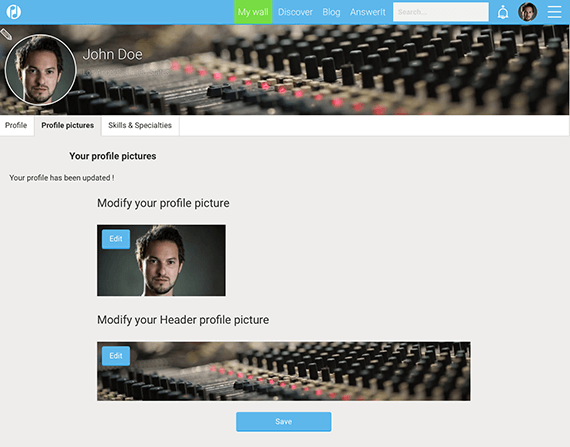 After the beta testing period, you will be able to share your profile everywhere you want, Facebook, Twitter, Instagram, … with the “Share your Profile” link. This is enhance your SEO factor ! You can already start using Answer It to ask questions to the community, about technical, business, legal, artistical…. Issues. It’s very simple to use ! The Search Tab on top of the page will allow you to find users by name, city, country, skill or specialty. Do not hesitate to use it, it’s very powerful. In the meantime, why don’t you have a look at the awesome articles we have published on our blog and share them if you feel like it? We talked about the great Delia Derbyshire who managed to realize Dr Who’s theme when the score she had between her hands said “sweeps,” “swoops,” and “wind bubbles.” We also talked about how composers scored the three Ed Gein-inspired films, The Texas Chainsaw Massacre, Psycho and The Silence of the Lambs. Then we moved to Archive’s ambitious project Axiom and we focused on the importance of dinosaurs in Michael Giacchino’s career. And in our latest articles, you’ll find some of your favorite video game tunes and great stories about your favorite or some still to discover composers. That’s all for the moment folks. The Score It team is very excited about the upcoming beta version, we’ve put a lot of work in it and we cannot wait for you to start using it, and get your feedback! You are more than welcome to report bugs and issue by using the little yellow bug “Report an issue” icon on the right of you page.